If you’re lucky enough to get by the Sea this year and have your baby or toddler in tow, even seemingly simple baby games work wonders to develop their key skills! 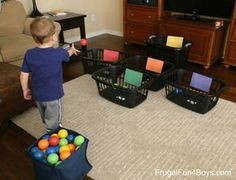 They’ll look like they are just playing but really developing skills whilst using these baby games…so get your buckets ready and go! Imaginations at the ready… pebbles and shells at the ready… and the kids will love making as many as they can! Why not get in a FitMama Workout in for 5 minutes while they play Picasso? Trim your Abs, waist and thighs with In the Sea Superset! Any games are great, and so many things you can do with a ball, perfect for children and babies of all ages. Rolling back and forth for younger children and kicking around for older knocking down sand castles playing skittles or bowling! Family Tip! Why not use the football at the end to press into the sand, which should make a deep circle shape. Now everyone can do this and draw their face in the circle with a stick, write their names underneath the ‘Sand face’, take a picture as a souvenir before you set off home! Babies and small children – encourage them to draw shapes like squares in the sand and copy the shapes of the bits you collected earlier. Older kids could have fun with seeing who can draw a four legged animal, a nemo fish, or a car; making it into game perhaps drawing characters from a film! If you child is a bit too young to draw shapes, get them to draw a few lines then you can play the ‘guesser’ telling them what you think they are drawing – make them feel clever and mummy silly – you’ll be sure for a few giggles!! Sensory Skill Tip! Every time your little one makes a shape in the sand with the stick, ask them to draw the same shape with their finger on your body – arm, back or legs – so that Mummy can feel what shape it is! Ask your child to use all the bits they have collected and make the most beautiful Sea Garden fit for a prince or princess, that can only be found in the sand! For the garden you can add dried flowers, shells, stone, seaweed or anything they can find! Take your baby’s hand and develop their senses by helping them to pick and move the objects getting them to feel each one – perfect for touch, eyesight and memory skills. Make footprints in the sand – all of the family so you can see the different size feet which will help the kids memory and attention when they watch the tide and footprints… time how long the footprints stay there for until the tide comes in and washes them away! You could even keep track of the time if you do it more than once – using the sticks to draw the numbers in the sand! A great way for your small child to practice their numeracy skills, feel and appreciate the textures and shapes of the different objects they find. If you have a baby, just picking up the objects and dropping them into the bucket will help their fine motor skills and co-ordination alone! A type of washing your little one(s) will actually enjoy! Get a bucket filled with water or if they are a bit older, they can do this at the edge of the tide; and take the collected seashells and stones, wash them in the bucket or sea and place into a clean bucket when shiny and rinsed! They’ll be thinking about what they can do with these next, developing their imagination! This is the classic we all do – but its great to make sure your little ones experience confidence,timing, and social skills! Wait for the waves to come then either play a game to run away or get wet! Great if you have a baby, sit on the sand with baby on your lap, just enough so when the tide comes their legs feel some water – depending how much they like it! Older kids can count how many waves come in 5 minutes and jump each time they come, also developing their co-ordination and memory! The classic seaside beach activity, that most of us adults pretend we are helping with but secretly have just as much fun! Really encourage your toddler or child’s imagination here telling them to make castles or any shapes they can! Help them dig a moat around the edge of the castle then fill up the moat with water to protect the amazing sand castle from the ‘enemy’! If you have a baby help them to pat the different sides of the castle down, to help them understand textures in their hands. Now you can help them learn how to work together – either with their siblings or with you! Buckets to fill up with water and holes need to be dug up to fill up with water! Now they’ve had some fun with stones they could put them in the base of the holes to make it a special water hole! Ready set go! Races can be fun across the edge of the sea, often if its just that little be too cold to go all the way in! Get a parent to be the judge and time it, and see who’s the fastest! If you have a small child, walk them along the end of the sea holding their hands but so they can feel the water on their feet! Sure to get some interesting reactions from your little explorer then! Love to enhance your baby’s key skills and keep your older children stimulated? At BeHappyMum, we are passionate about supporting Mothers, so why not try PlayMama App? 90+ Learning Games for Babies 2-23months with more for older children coming very soon..! What have you played with your little ones this year by the sea? Tell us below for your mummy tips! Top 20 White Lies Parents Tell Their kids!Enjoy the World Cup Whilst Kids are Busy with These Activities!